This tart was inspired by two things: the lovely sourdough plum cake I spotted a couple of weeks ago on Steffen’s Dinners, and the abundance of blackberries that grow all over this wild little town I have called home for the last two weeks. The plums are just beginning to ripen, too. 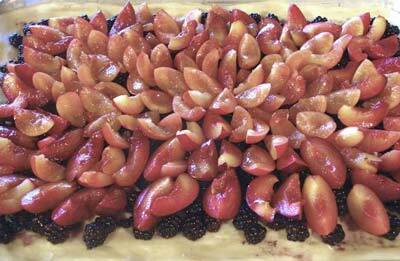 The red and purple ones I used for this were just this side of still-hard, so they made for a nicely tart tart. I also used a few wild fennel fronds to scent the blackberry filling. As with all doughs here in this minimalist kitchen, I mixed by hand. The dough has very little sourdough starter in it, so it takes a long time to ferment. I mixed it the night before and had the fresh-baked tart for breakfast. The dough doesn’t proof a second time after shaping the tart, so the crust is dense and crisp, almost like a cookie. Good for standing up to juicy berries. This goes to Susan (Food Blogga) and Jennifer (The Domestic Goddess) for the Berries edition of Sugar High Friday. 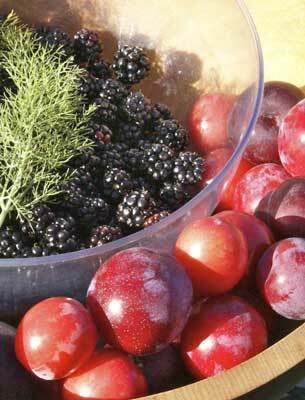 If it’s summer where you are, may it be filled with blackberries and plums! To make the dough, combine all the ingredients in and mix by hand until the gluten has reached a medium-low level of development. (This took me about 10 minutes.) The dough has a fairly stiff consistency. Place the dough in a bowl, cover, and ferment at room temperature for 8 – 12 hours, until doubled. 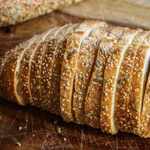 Gently stretch the fermented dough into a 10 x 15-inch rectangle and place it into a sheet pan of the same size that has been brushed with olive oil. For the filling, toss the blackberries with the brown sugar, cornstarch, and fennel, and spread them over the crust, leaving about a one-inch margin. Arrange the sliced plums on top of the berries, cut side up. Bake at 400F for about 40 minutes, until the berries are oozing juice and the crust is golden brown. While the tart is baking, make a simple syrup by bringing the sugar and water to a boil in a small saucepan. Cook for about a minute. 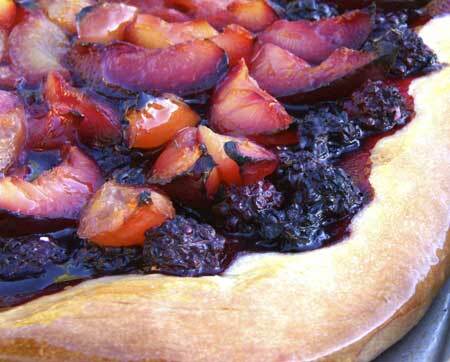 Brush the crust of the baked tart, and the tops of the plums, with the syrup. Looks gorgeous and delicious! I have a nice, sourdough sweet base much like this one to use alone as “pain au lait” or as a base for any number of tarts, buns, etc. Plums and blackberries sounds absolutely delicious! The season is in a few weeks and then I’ll give it a try. Susan, this looks great! Too bad that our plums are almost gone … not sure that there are still enough left on the tree to try your recipe today. This looks wonderful, and oh-so seasonal! I have really been enjoying the plums around here lately, and now you’ve inspired me to try them yet another way! 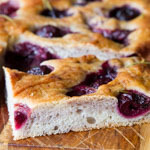 I hadn’t thought about using fennel in a tart or with plums & blackberries before. Sounds delicious! I bought a large quantities of plums this last weekend with a tart in mind. I’m looking forward to trying this. Jane, I hope you’ll post yours, which is sure to be fabulous! Deeba, thanks! 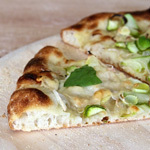 Of course you can use any crust you like, doesn’t have to be sourdough. Steffen, this tart is huge, maybe you have enough plums for half? Thanks again for the inspiration! Jen, nothing like plum season in California! Claire, we have a lot of wild fennel around here, and it kept calling to me! Oh, Susan, a summer filled with fresh, plump blackberries and juicy plums sounds enchanting to me. And speaking of enchanting, I am smitten with this tart. I had never thought to use a sourdough crust before. It must be lovely especially with the savory fennel fronds. Thanks so much for a truly delicious entry! Susan from FB, thank you for hosting SHF with a great summer theme. I’m looking forward to seeing all of the other delicious entries! the idea of a sourdough tart is brilliant. why didn’t i think of this? thank you. Hi Susan. First I must say how much I love your blog, it’s been an inspiration to me for a long time now (why didn’t I say anything earlier?). How would you compare this tart with the brioche tart you’ve posted? I’m always (too) eager to cut down the fat, so this one appeals to me, but can it pass as dessert (for people who are used to my low-fat, not-very-sweet baking…)? Wow! This looks amazing! I really like the addition of the fennel fronds. Thanks susan for this recipe, it’s great. I have tried it with plum, and i am thinking of pineapple next. It’s pineapple season over here! thank you!